After a day touristing in our own country yesterday (there are some pictures on Instagram, and I’ll post some photos from the real camera soon), I’m out and about again today, virtually and actually. 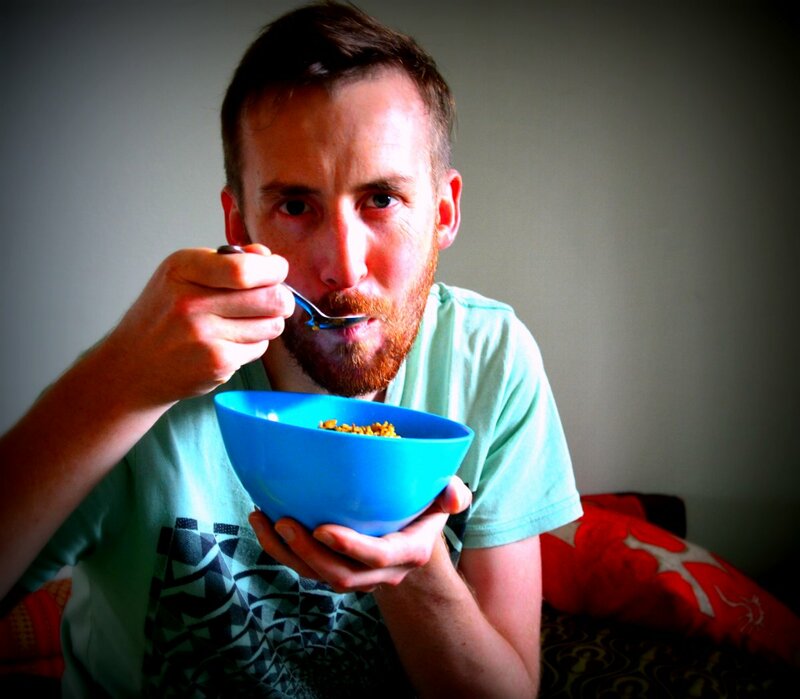 My first post as a contributor to Modern Alternative Health is up. You can find out about my natural homemade deodorant, and how to make some for yourself. I’m very excited to be involved with the team over there, and will be posting something with them every month about natural health and my hippyish tendencies in that area. We’re leaving in 20 minutes for our trip to Kuching with The Engineer’s parents. We’re excited to see some wildlife, go to a world music festival, and explore the city called Cat. We’ll be back early next week with memories, stories, and lots of photos. 1. I feel like it’s April, not the end of June. 2. 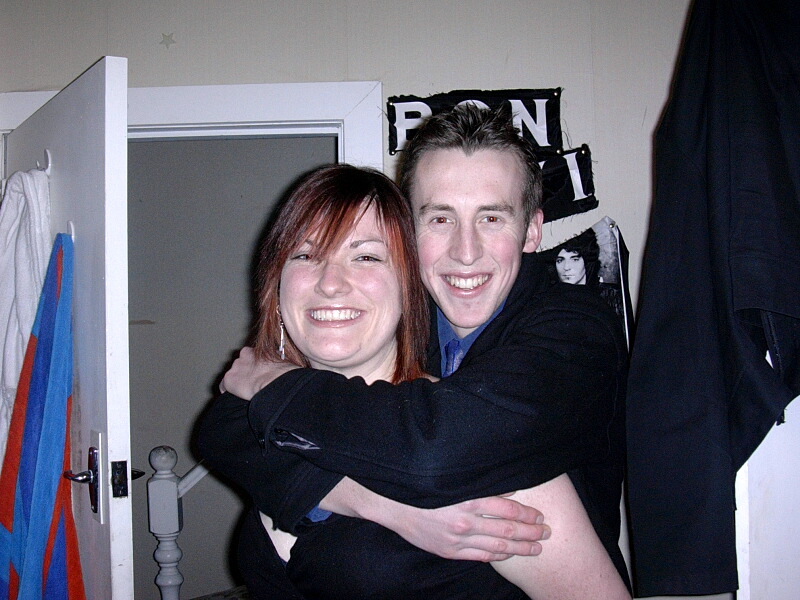 It means that his 21st (three weeks after our first date) was 9 whole years ago. 3. Thirty year olds are supposed to be grown up and stuff. If you’d asked this couple what they’d be doing on the dude’s 30th birthday, I honestly don’t know what the answer would have been. I suspect they would have thought they might be married, but I’m pretty sure the rest of the details wouldn’t match up. Me and The Engineer, last week. But I don’t think they’d be disappointed about where they’ve turned up. They’d be stoked that I had a rad shaved head and a giant tattoo and that The Engineer had a sweet beard and great style. They’d think it was awesome that The Engineer had a fancy engineering job that he enjoyed, and that brought us overseas, but they might be surprised that I wasn’t working. They’d definitely be surprised that there weren’t kids in the picture, but I think they’d be impressed with the things we’ve done instead. Most of all, I think they’d be happy that we’re still together, changing and growing with each other, and trying to create the best life we can. And many people look back on their early 20s fondly (including me). But I would definitely rather be us than them! The Engineer had to work on his birthday. But that didn’t stop the celebrations. We started with breakfast (Happy 6:30th Birthday), and I sent him off to work with a Survival Kit to cover him until Happy 4:30th Birthday. There are a few things up my sleeve to cover the rest of the day, including a dinner with his parents (who are visiting) and some friends. We haven’t seen each other much, but it’s been fun getting updates with each present he opens. And I think he has enjoyed opening them too! So, a happy happy birthday to the raddest dude I know. Thank you for everything! As some of you may have seen on Facebook, or on my post about urgency, I have recently had a change in hairstyle. Quite a major change in hairstyle. Last Saturday, I shaved my head. Me and my new ‘do. 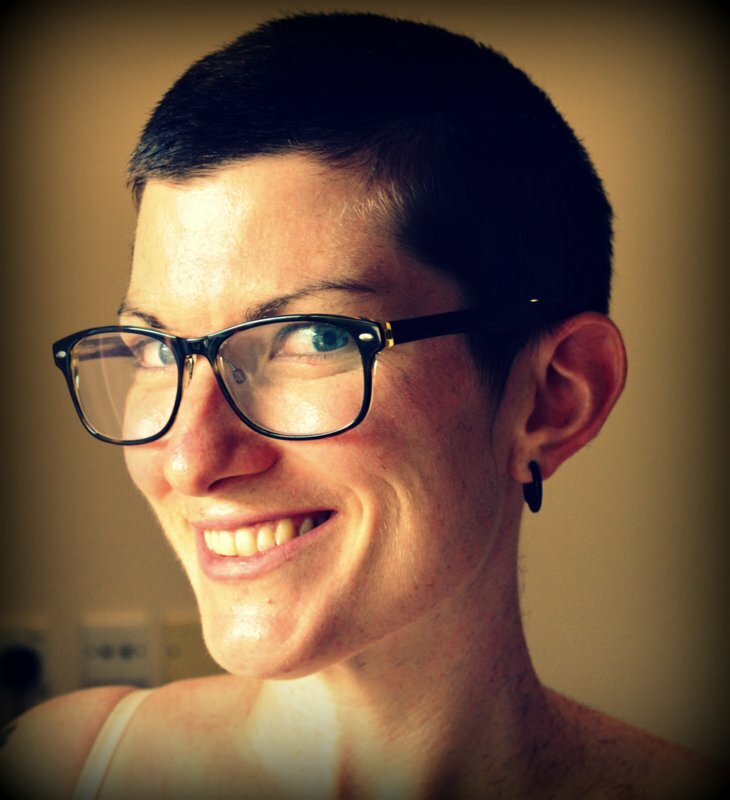 You might think it’s not a very big deal for an already short haired lady to shave it all off. But I can tell you – it’s kind of a big deal. That hair on top of your head? It makes a big difference. When you have hair on top of your head, you might think you can see the shape of your head, but you’re wrong. I was genuinely surprised by how weird it felt, and by how weird I looked. The Engineer assured me (about a thousand times in the first couple of days) that I did not look like an alien. But it took me a while to believe him. Six days on, I can finally look in the mirror without getting a fright. And I’m actually starting to like most of the photos taken of me (it took two attempts to capture the photo above, compared to about 50 to capture the first photo for the Facebook reveal). I totally get that shaved heads aren’t for everyone. But I think it was something that I had to try at some stage. And when I reflect on it, I think this was the perfect time. People here stare at me all the time anyway, so the shaved head doesn’t get me any extra unwanted attention. 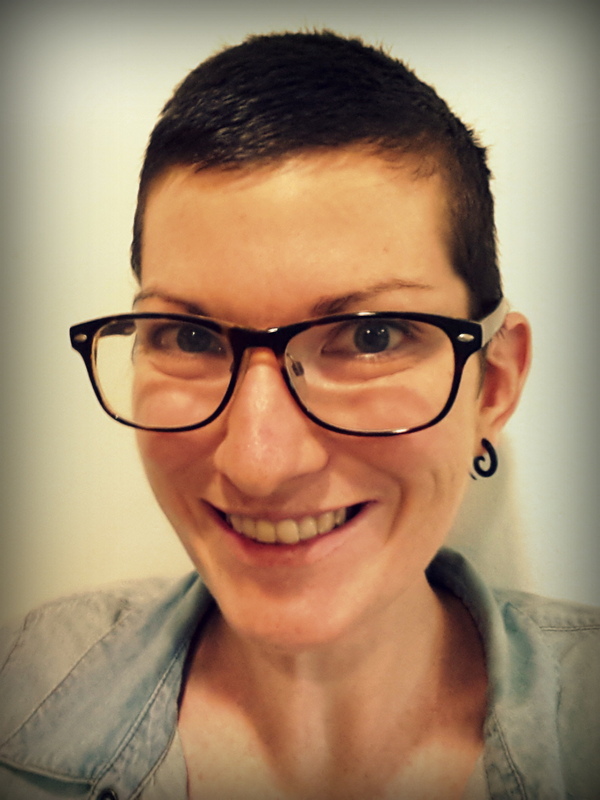 Plus, now I have a reason to explain away the stares “They’re just staring because I have a shaved head, it’s sweet”. It’s hot here, and the less hair you have, the better. It’s humid, so hair can take a while to dry properly. Even my short hair would often be wet for ages after a shower, and that made it hard to style. With a shaved head, I don’t have to worry about wet hair at all. I don’t have to go to work or worry about looking professional. I think I look perfectly professional with no hair, but I know that not everyone would agree with me there. And that thought would have given me pause when I was a working woman. As a writer/housewife/traveller, this was not even a consideration. It’s great for swimming. We try to get to the pool and the beach quite regularly, and having no hair makes this much easier. No salt and chlorine build up, no swim caps, no hair sticking out every which way from the salt. I’m not sure what will happen next hairwise. I might keep it shaved. I might find another length in the growing out process that I prefer. I might go back to the quiff. I might grow it long again. (Actually, that last one seems unlikely.) But it’s great for me now. And now that I don’t feel like I look like an alien, I’m going to rock the shaved head for however long it lasts. Another week, another challenge, another lack of ideas. I’m getting pretty fed up with starting these posts with “We couldn’t think of anything…” But these are getting harder and harder to come up with. The difficulty is partly that we’ve done quite a few already, and partly that our scales of weirdness are recalibrating slightly (“Jelly drink that looks like it has mould in it? Not weird enough!”, “Chicken porridge? Definitely not weird enough.”, “Dried fish snacks? Not weird enough”). And this week the “we couldn’t think of anything” was definitely true. 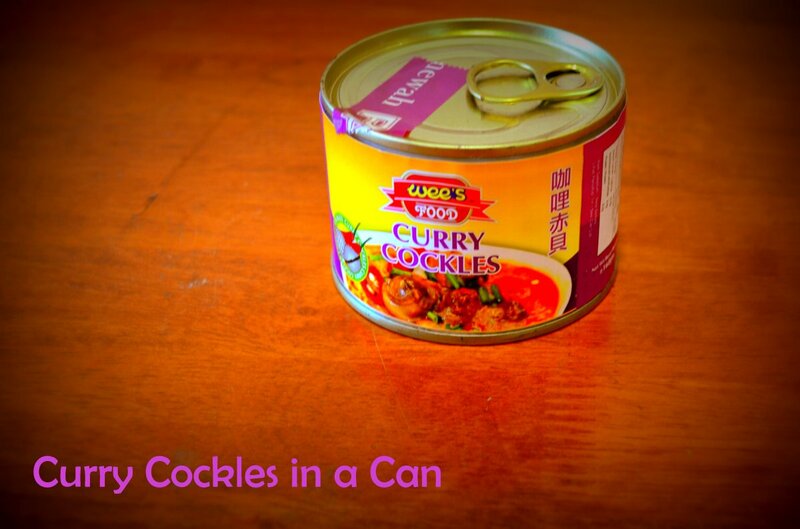 Curry Cockles in a Can. When it came to lunch time, The Engineer was out, so I got things ready. 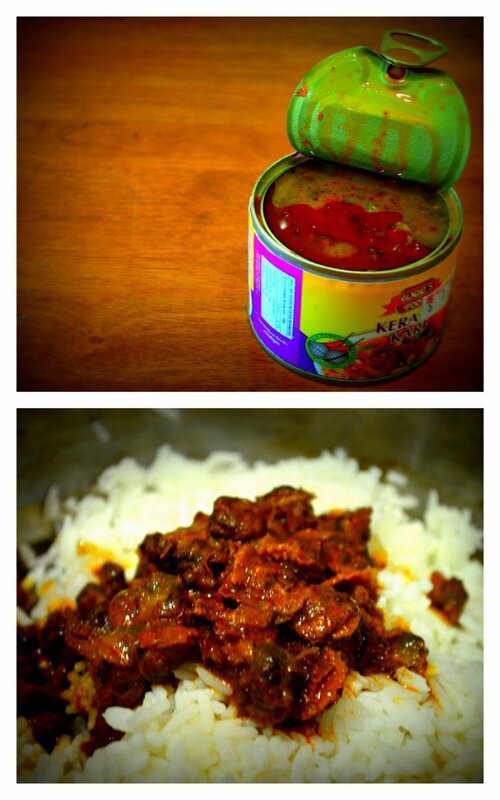 I opened the can, and had a smell and a taste, just to check if I was too cruel for giving him only this as his lunch. It actually didn’t seem too bad, so I got to preparing. I wanted him to appreciate the flavour, so I kept it simple, and served the curry cockles with plain rice and nothing else. Doesn’t look too bad, huh? ‘I can’t believe you’ve just been eating this as if it was a normal lunch!’ My small bite was more than enough for me. The cockles had a weird pasty texture, and the flavour was just not right. There was a definite curry flavour, but it was accompanied by an overly sea-ish, slightly off taste. Let’s just say, I was very glad this was not my lunch, and that I could get rid of the taste with a delicious spicy chicken wing. When The Engineer gave up, leaving half of it uneaten, he swore it was just that he was full. He said it wasn’t too bad, except for the odd sandy bit. And he really seemed to mean it. I wasn’t quite so sure though… I don’t think we’ll be buying any more canned curries in a hurry. Squid or chicken might be better. But for the same price as that can of curry, we could enjoy a Nasi Campur from our favourite riverside foodcourt. Which would include rice, vegetables, and an actual nice curry. I know where I’ll be putting my money in future! In a previous life, I worked in Human Resources and Organisational Development projects. A key part of this work was leading large scale change, and teaching others how to manage change. The model that we used most in this work was John Kotter’s Change Leadership model. The first step of the model, and the step that I personally think is the most important, is to create a sense of urgency. In an organisational sense, this stage is about having a compelling reason for making the change, and making people not just understand but feel the need for change. This step has been floating around in my brain a lot lately. Because although there are a lot of great things about being a lady of leisure, one of the greatest challenges is creating this sense of urgency. And putting that lady of leisure in perhaps the most relaxed country on earth, certainly doesn’t make it any easier. When I get up in the morning, sure I could do the dishes straight away. But there are 9 more hours in the day for those. When I sit down to write, sure I could have a mammoth session, and get a few thousand words down. But there are so many more days for that. When I’m feeling a bit down, sure I could make a real effort to work through it, but there’s no real need – I have the time to wallow for a bit. In some ways this is great. When I am exhausted, I love having the flexibility to have a nap in the afternoon, and do my writing later. If a friend wants to meet for a coffee, I love that I can just do it. If I feel like a massage would be nice, I can head into town and get one. But in some ways, it’s not so great. I love my life, but there are also things I want to change. I want to be a more consistent blogger and housewife. I want to write more and read more. I want to walk and think more. I want to meditate. I’ve got the new hair cut. Now for the new life! So I’m getting back to my roots, and trying to find some ways to create urgency in a very non-urgent life. The first step of the change model is really about WHY change is necessary. In my situation, the very simple reason is that I want to change. I want to come back from Brunei a different person, and I want it to be a positive change. I want to get a better understanding of what motivates me, and what creates positive energy in my life. I want to know as much as possible about myself, and how to live an authentic and awesome life. And every day that I’m here can either be a move forward along that journey, or a step in the wrong direction. I want most days to be the former. Put it out into the world for accountability. It’s very easy to keep these things to yourself when you’re home alone all day. I hope that putting this out into the internet, and letting my friends, family, and readers know, will give me the little nudge I need to make some changes. Create a solid morning routine. Usually, if I get off to a good start, my day will be fairly productive and satisfying. So if I have a consistent start to my day, involving yoga, meditation, and writing, it will be a step in the right direction. I’m not sure exactly what the routine will look like, but I’m working on it. Get someone else on board. As much as I would like to have intrinsic personal motivation for everything, there are some things that just don’t do it for me. Like dishes. Having some else (The Engineer) check in to make sure that I’ve done those things helps me to stay on track. Fortunately, he’s a pretty good boss. Create deadlines and challenges, even if they’re arbitrary. It has taken me a while to write this post. The idea has been floating around in my head for a while, and I’ve been thinking about what to include. It’s been surprisingly difficult to admit that the life of leisure is not all plain sailing for me. I understand that this is a great opportunity, and that is why this has been so hard. But I think that admitting the challenges is absolutely necessary for making the most of this opportunity, and the list of ideas I have above feels like a positive, but not too strenuous way to do that. I think I’ve mentioned before that the food here is pretty good. We love char kueh teaw and mee goreng and nasi ayam. 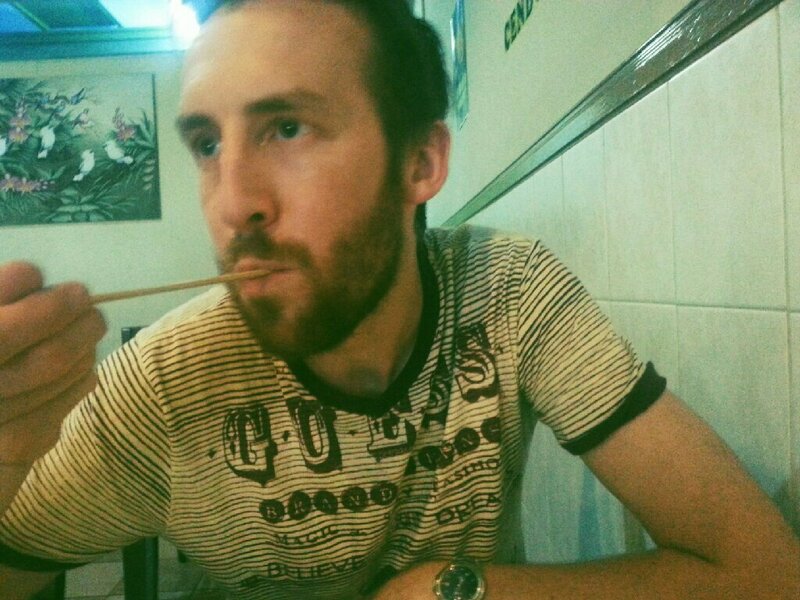 There are some great Thai and Chinese and Indian places too. But it’s mostly Malaysian food. None of the food is really uniquely Bruneian. So when we heard of ambuyat, which is a sago based side dish only found in Brunei, we knew it had to be one of our challenges. 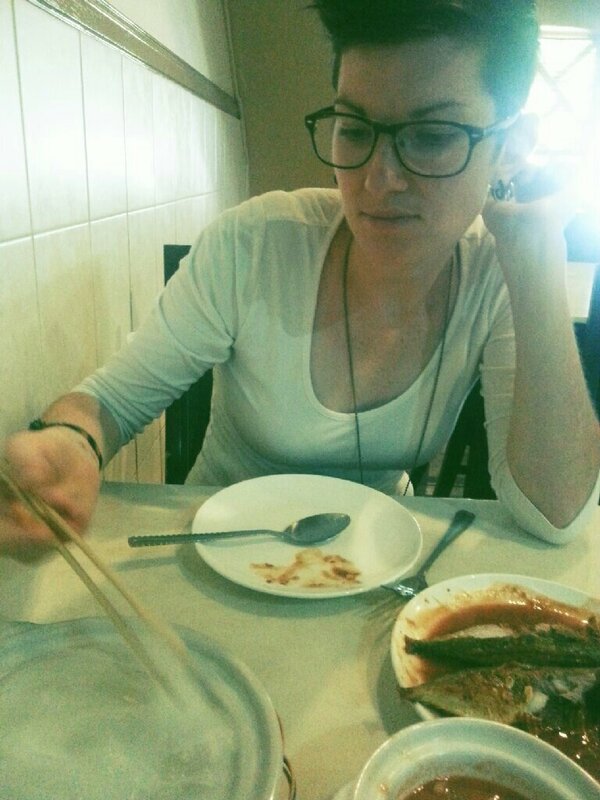 And when we were traveling up to the capital last weekend for a bit of shopping, we thought it would be a great opportunity to try the best ambuyat Brunei has to offer. After a quick Google search, it looked like a chain called Aminah Arif was the place to go, and there was a branch right near our planned shopping area. Our decision was made. Ambuyat is made from the interior trunk of the sago palm. It is boiled in water, and somehow transforms into a kind of paste. This paste is eaten with a bamboo implement that is a bit like a pair of chopsticks attached at the top. The ambuyat is twirled around, dipped in sauce, and swallowed without chewing. This is ambuyat in all it’s crazy glory. When we arrived at Aminah Arif, the first challenge was the menu, which was entirely in Malay. My menu-Malay is getting pretty good, but the language of ambuyat was unfamiliar. We were glad to have a very helpful waitress. With her assistance, we got an ambuyat set, with dry beef, steamed fish, cabbage, and sauce. We weren’t sure on the flavour of the sauce, but we know it wasn’t durian, which is a definite win. The food arrived, and another helpful waiter showed us the ambuyat eating technique. And all that was left was to dig in. 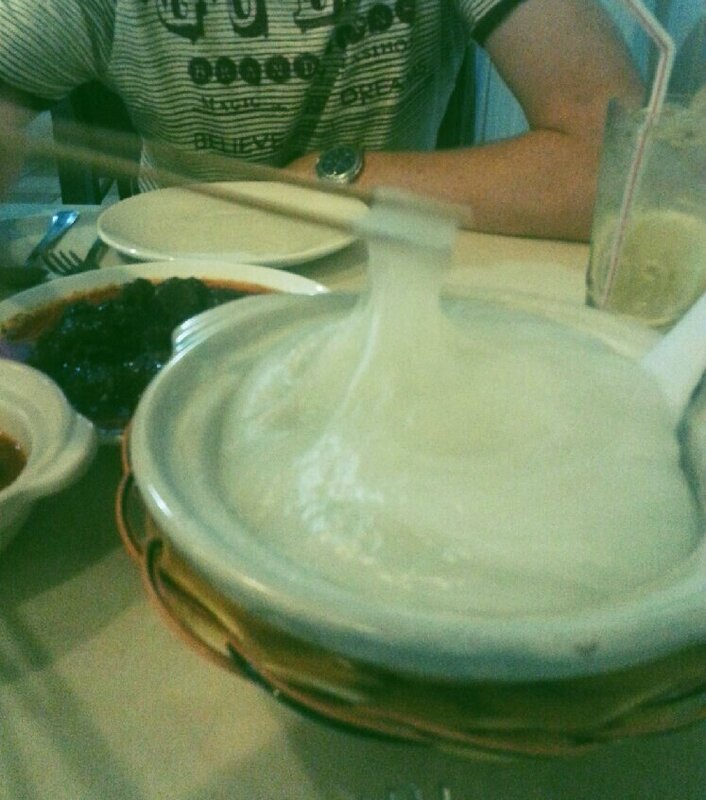 When we first tried the ambuyat, we were quite impressed. The sauce was tangy and the texture was not as bad as expected. But as it cooled down, it got worse and worse. The tangy sauce had a sicky sweet flavour and, combined with a quickly solidifying paste, our gag reflexes started making themselves known. It got harder and harder to swallow until we just gave up. The Engineer is not impressed. I’m willing to give it a go. Overall, we are glad that we tried this uniquely Bruneian and interesting dish. But I doubt we’ll be trying it again without a good reason. Bland side dishes certainly have their place, but it would take something pretty good to beat rice. And ambuyat really wasn’t that good. This is the second post in my expat bookshelf series, sponsored in part by Summertime Publishing. This series includes books that have related to my expat experience, so today includes a book on writing. And yes, so far, all books reviewed have been by the same author. What can I say, she writes about things I’m interested in! Write your life stories is a workbook in eight lessons, designed to help anyone write better life stories, whether for a book, a blog, a personal journal, a memoir, letters to home, or anywhere else you might feel like writing a story. I discovered this book when I attended a writing workshop with the author. 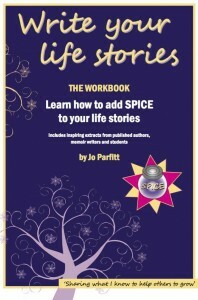 The workshop was only half a day, but the SPICE method of story telling, and the guidance from Jo revolutionised my writing, and really sparked me to actually WRITE my novel (which is now 15,000 words long! ), rather than just thinking about it. Overall, I thought this book, and the course contained, was really good. It breaks down story writing into manageable chunks, and each of the eight lessons contains both a limbering up/warm up exercise as well as the “real” task. The warm up exercises are a lot of fun, and really help you to get into the real task. And the course progresses through logically, which means that each stage is not scary, but by the time you’ve reached the end of it, you’re at a place you never thought you could be. The SPICE tool (Specifics, Place, Incident, Character, Emotion) is perfectly logical, and seems like common sense. But turns out common sense isn’t always easy when you’re writing, so SPICE provides a great checklist for writing, and a really simple way to look at your writing in a different light and improve it. This was my biggest take home from the workshop I attended. Each section of the book also contains extracts and pieces of writing to inspire you. I loved reading through these. They weren’t all “top-notch” writing, but they related to the lesson, and were a good source of ideas and different perspectives. Plus, I think that reading writing that doesn’t necessarily strike you as great can be really useful for seeing what you would do differently, and what doesn’t really work. This is supported by the editing section (a bonus lesson), which shows how the editing process might work, and helps to identify ways to improve a piece of writing. The book also comes with optional extras (podcasts, feedback packages, inspirational stickers, personal tutors). I didn’t take up any of these offers, but if the course is anything to go by, they could be very useful. Overall, I thought the book was really good. And if I’d worked through it before I attended the workshop, I might be giving the book 5 stars. But as it was, I thought the in person workshop was a whole lot more valuable for me. So I’d say that the book is definitely worth your time, but if you have the opportunity to attend a workshop instead – do that! As far as I know, Jo doesn’t have any workshops planned now, but you can check out her website to see what else she’s up to. As you may know, our usual time for weekly challenges is Friday afternoon, when The Engineer has time off work. This week was a bit different though. The Engineer had the whole of Friday off (it was the Armed Forces Anniversary), and we were heading to Labuan (a small Malaysian island that’s a one hour ferry ride away) for the weekend. Unfortunately, our planning was a little bit lax, and we did not really consider the long weekend. So on Friday morning, we showed up at the ferry terminal, planning to just buy some tickets and get on a boat. The internet had told us this would probably work out and that booking ahead was not necessary. In this case, the internet was wrong (shock! horror!). Our “show up and buy” strategy turned into “show up and get in line for a ticket counter that may never open”, which turned into “stay in line for three hours”, then “forget until 11:59 that everything closes for 2 hours at 12:00 on Friday and have Cheezels and 7Up for lunch”. 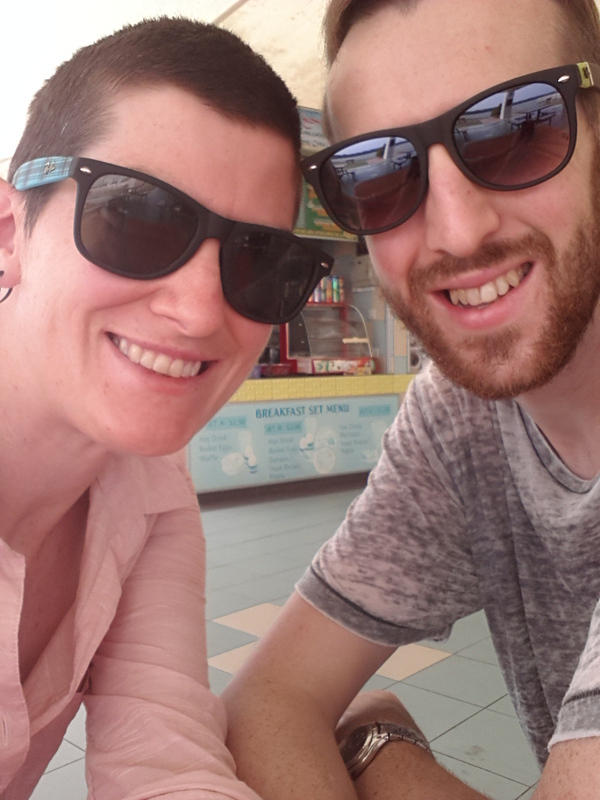 Long story short, when we finally arrived in Labuan, a challenge was the last thing on our minds. Saturday was not much better. We didn’t get much “done” as such, but we were busy (beaching, restauranting, working out transport). This was a little bit similar to a previous challenge (Yam and Sweet Corn Ice Cream). 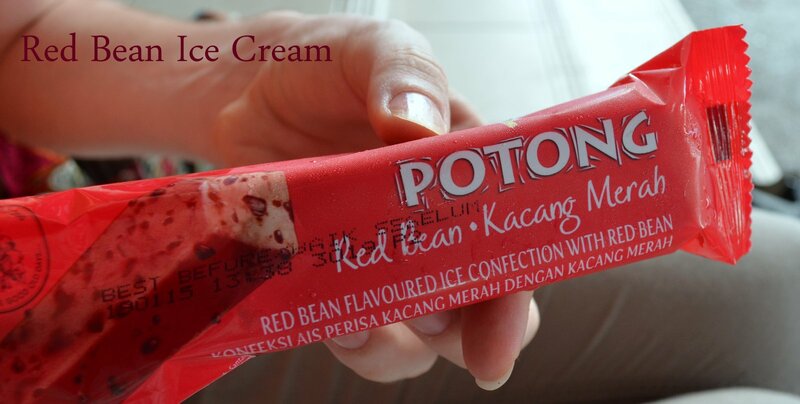 And in fact, this brand of ice cream also came in Yam and Sweet Corn. But it was the weirdest looking thing in the freezer. And I didn’t even care about the weirdness, because it was hot and we’d been wandering around town all morning carrying our backpacks. 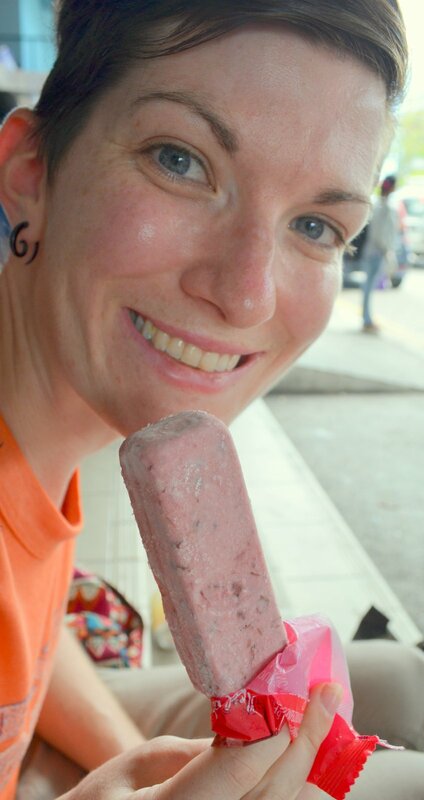 I was hot, and tired, and an ice cream (even a red bean one) sounded pretty darn good. It wasn’t quite as chunky as it looked on the wrapper. We found a seat on the steps outside the ferry terminal, secure in the knowledge that we had booked our tickets in advance this time around (as soon as we arrived on Friday, in fact), and that we were not in the massive lines that had started to form. 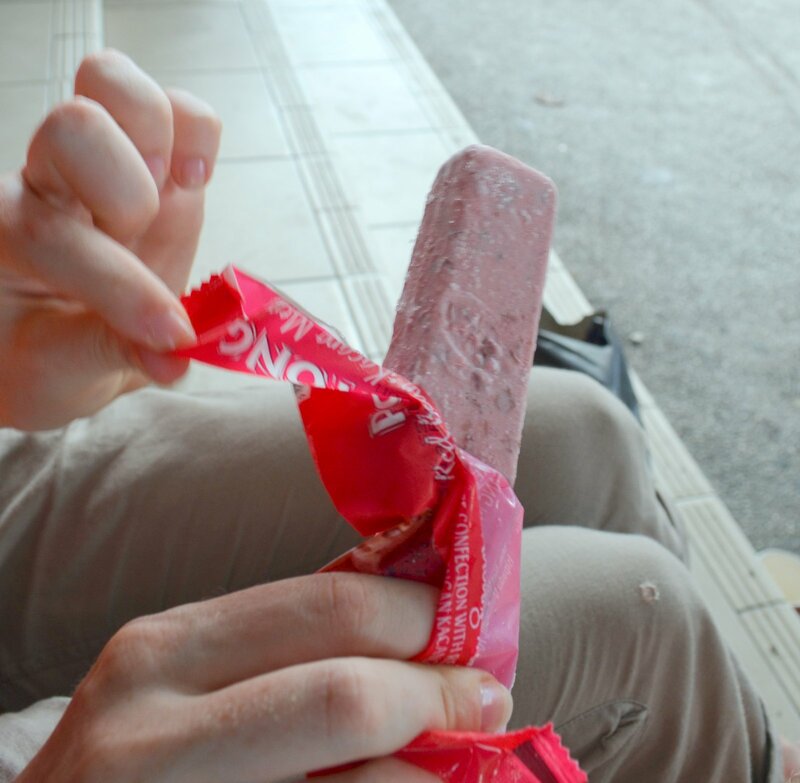 And while we waited to check into the ferry, I broke open the ice cream. When I opened it up, I was glad to see that the ice cream wasn’t as chunky as it looked on the wrapper, and that it was really just ice cream (the label Ice Confection didn’t guarantee this). So I happily gave it a go. And overall, it was pretty good. The flavour was not too exciting, but was nice enough. It tasted sweet, and slightly red-beany. But mostly just like an ice cream. The main problem was the texture. Despite appearances, it was fairly chunky. And the big chunks of bean, while not that unpleasant, were somewhat offputting. Beans are not exactly the hokey pokey I was raised on (and I’ve never even been a big fan of hokey pokey). The ice cream was also frozen extremely hard. I get why – it’s HOT around here – but it’s still not something I’d put in the pros column. And unfortunately the hardness didn’t even stop it melting. I had ice cream running down my hand in minutes. I gave it a good go, but overall I just thought the ice cream wasn’t worth the dairy and sugar (both things I try not to eat much of), so it went the way of most of our challenges – to the rubbish bin. It wasn’t bad, but it was certainly no Magnum* (the chocolate coating helps the melting issue, and the taste is definitely worth the dairy and sugar! Mmmmm Magnum). a Magnum is just plain vanilla ice cream coated in chocolate, but it’s the premium version of this classic combo, and is my ice cream of choice. a Trumpet is a cone (lined with chocolate), filled with ice cream, and topped with chocolate. Also similar – Cornetto. A classic choice, but not something this (mostly) gluten-free lady indulges in often.